First House Meeting AKA Devin's Melt Down! So thinking I was done with the Big Brother live feeds for the night, Devin had other plans. There were two separate incidents that led to Devin's House meeting. The first involved Nicole Christine and Amber. Devin was trying to be a middle man for Caleb and clear up the situation that was, or is, happening with them and their showmance. He confronted Amber about the situation in front of Nicole and Christine to make it one awkward conversation. When trying to leave, Christine was able to get away but he Nicole wasn't so lucky. Nicole didn't want to be in the room because she didn't want to get involved. Things that other Houseguest have mentioned to Devin were mentioned in this talk between Amber and Devin, but Amber later tells Caleb that most of which were not true at all. Caleb and Amber then caught up with each other on stories and truths of what was actually said and what wasn't. This cleared the air between them, not sure if everything is still fine, but this way they didn't have to go through a Middle man (Devin). She mentioned when talking to Caleb that she felt disrespected by him and felt that the conversation he had with her was unnecessary. 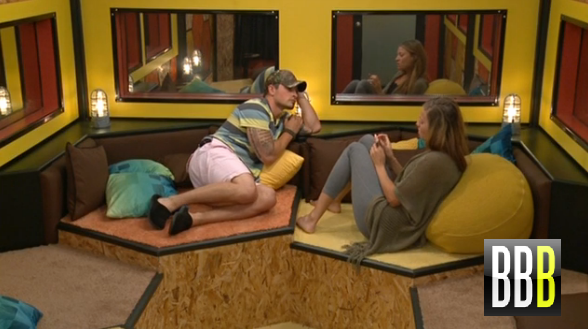 Meanwhile, While the two were getting stories straight in the Bee Hive room, Deven woke Donny up from his bed and sat next to him asking if it would be okay if the two talked first before the house meeting. After being woken up, Devin told Donny that the reason why he was on the block in the first place was because of him. That he went up to Caleb and and forced him to put Donny up because there was not trust between them (Even though they had an alliance called the Double D's). He wanted to ensure that he set a great example for his daughter and to show her that integrity is worth more than any dollar amount. So he apologized to Donny for having him nominated and being the great guy that Donny is, he accepted his apology. While the meeting was going on, Devin basically summed up to all of what what he had just told Donny, Donny was sleep and not in attendance. He mentioned again that he wanted to set an example of his daughter, and that prior to coming in this house, he had a whole different strategy in mind, and then now that he is in it, it has changed for the worse. All he wants is for 'America to clap for him when he walks out the door' (might be too late for that). There were tears shed by Donnie, no other house guests cried, but they did all clap for him. After the meeting there were many shocked faces as to what had just happened. Frankie went into the storage room with Zach and mentioned that they need to pull the whole house against him now, while Pow Pow was wondering if that was a game move or real. We know from past seasons that house meetings NEVER work (unless you have The Dan Mist), so it will be interesting to see how things unfold with tomorrow being a LIVE eviction, and then a battle for TWO HOH spots. I think its safe to say with the way things ended and the side conversations that occurred after, there is a strong possibility that we may see a certain someone on the block this week. Thanks Dennis! I went to sleep and woke up madness! 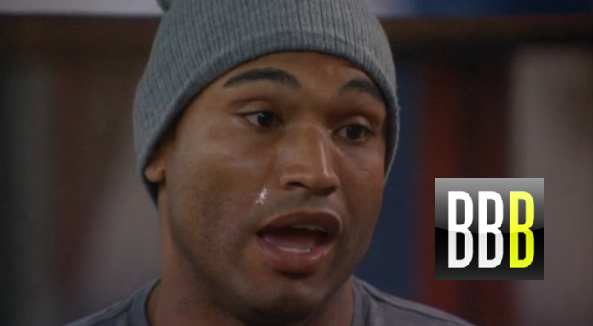 Devin must have a bingo card of BB moves he is trying to fill before week 1 ends. I cannot stand Devin!! I don't care how much soul-cleansing he does; he's a big bully and needs to be evicted! He treats women like crap and is the worst example for his daughter!! He is ..narcissistic and very manipulativewhat people confront him about things he's done he always turns it toward them done he doesn't listen he has to make himself look good all the time. Narcissistic people have no inner core the only live on the outside of themselves and what people seein for him he has to look good at all times it so when he behaves in ways that he thinks he does not look well he has to fix it is fast as possible and he uses his daughter is for the reason but the truth isthe self-image is something he feels he has to protect at all times and that's most important thing. Devin as HOH is like giving a loaded gun to a child! Can't wait til they vote him out. Wildcard!